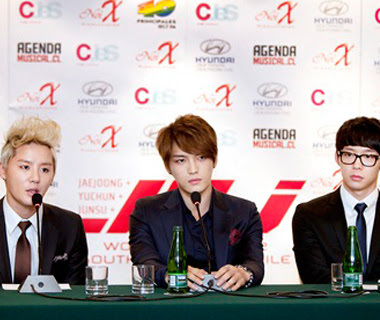 MANILA, Philippines – Korean boy band JYJ broke their silence on the issue regarding their sasaeng, or stalker fans, confirming they were victims of invasion of privacy and stalking. JYJ spoke about the issue during a press conference for their concert in Santiago, Chile where they were asked about the issues on sasaeng fans. Reports said these sasaeng fans follow JYJ 24/7, invade their homes and even hire taxis to tail them. Kim Junsu confirmed that these are all true. “They use our identification to expose our private phone calls and also place GPS trackers on our cars to monitor our every move. There were instances of breaking and entering where fans would take pictures of us while sleeping, try to kiss us, and steal our private items. Some fans even hired taxis to collide into our cars to see us in person,” he said, according to a translation by fan sitewww.princejj.com. Sasaeng fans have been doing this since JYJ debuted under TVXQ in 2004. News articles and audio files were uploaded online alleging that two JYJ members cursed and hit sasaeng fans. Despite what they’ve been through, Jaejoong apologized for their past actions. “We want to give an apology for our past behavior. We are sorry that we caused our fans to worry about us and that we forced them to share our pain,” he said. He added that they will be more careful in the future and not break down again. “In the future we will think about those who love us whenever we are facing situations which are mentally difficult and will try to act more responsibly. Because of those who support us through the pain we go through, we will try not to break down again. For those fans who always cherish and support us on stage, I will do my best,” Jaejoong said.